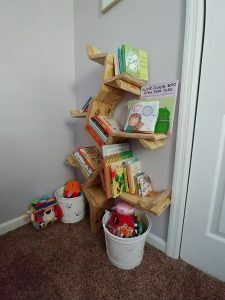 I’m so grateful that frugalfirefly.com is here today to write this guest post on the Top 6 Frugal Nursery Tips. Enjoy! In just a few short weeks, I will embark on a new journey. One that hits at the very essence of what it means to be alive, and it’s enough to overwhelm and terrify me. That’s right. I’m going to be a father! A father of twins, no less. That’s 200% more father than I was before. Never before have I been part of something so massive, so important, yet felt so out of my control. My wife is literally growing people right now. I can’t even keep a house plant alive. So when it came to putting the nursery together, it’s fair to say I was out of my element. I decided to fall back on what I am competent at – using frugality to get more for less. Here are the six frugal tips and tricks I used to hack our nursery! As first-time parents, our inclination was to buy everything new. After all, our girls are worth it! But as it turns out, most parents feel this way. Those new items are only used for a couple of months until your kids have grown. In fact, you may not even get to use everything before they get too big for it. This means that consignment shops, yard sales, and fundraising events often have new or near-new items for drastically lower costs. We’ve been lucky to find bottles still sealed in the packaging, diaper organizers cleaner than most of my clothes, and more mats for tummy-time than you knew you needed. If you don’t know what tummy-time is yet, don’t worry. You still have time. At a recent children’s sale event in our hometown, we scored over $250 worth of items for under $70. How’s that for a frugal win? Just don’t tell our girls! They say it takes a village to raise a child, so why not check out some of the village’s old hand me downs? Some items such as a Pack ‘n Play® may be invaluable when your little one is, well, little, but it becomes a space-consuming nightmare in later years. This often results in tying up valuable storage space in the house, or even losing perfectly good items to the landfill. This kind of waste is just a shame. Instead, many family members may be overjoyed to give you old items for free, and get rid of their clutter in the process. We actually had to turn family members away since we had already been given too much! Plus, if you really want to be frugal, you can start a similar process earlier in the pregnancy. We’re giving my wife’s large pregnancy pillow to her pregnant cousin. Not having to buy a pillow herself? Worth over $100. Seeing her husband’s face once he realizes the pillow takes up his half of the bed? Priceless. We went with Target but several stores do something similar – anything placed on your registry that is not purchased by your shower is granted 15% off. That’s right. Instant savings! We put everything on our registry we could. Items much too expensive for any rational person to purchase for you? Yep, put it on there. In fact, put one of each color. You don’t know how your tastes might change in a few weeks. After the shower, we logged on to get bigger-ticket items such as car seats and strollers. If you can’t get it free, get it at a reduced price! Between the 15% off and gift cards we received at the shower, we saved over $250 on remaining nursery items. When it comes to a nursery, a cute idea is worth its weight in gold. Almost literally. Take for example, a kid’s bookshelf that looks like a tree. Prices online range anywhere from a few hundred to well over a thousand dollars. It’s a cute idea, but over $1,000?! I can’t justify that as a frugal soon-to-be dad. It cost me less than $30 in high-quality plywood and glue, and took around three weeks to build. I left the wood knots on the outside to make it look more like a tree, but you can decide what works for you. Anchoring to the wall was as easy as installing one L-bracket toward the top of the tree. There are plenty of videos out there of how to make one yourself, but here’s the one I followed. You can also personalize it to the space, whereas a purchased one may not fit quite right. And added bonus? Your in-laws think you’re pretty much the best father in the world. A bit wary of making everything yourself by hand? Etsy remains an amazing source that showcases creativity and adds a personal touch. But just like with the bookshelf, we were unwilling to buy hand-crafted pictures to decorate the nursery. They were far too expensive. Here’s another option – digital downloads. We found a set of six digital downloads for our woodland-themed nursery for under $16. Frames were purchased on sale online, and the whole decoration came in at a fraction of the cost of completed prints. As with the bookshelf, doing it yourself gives you more customization options. You can pick the frames, type of paper, and print out multiple copies if you want to use duplicates. Want to purchase the same prints we did? Check out the shop here: Adoran Studio. Finally, decorations are in hand and it’s time to put it all together. Are you feeling a bit overwhelmed yet? If so, invite the family over for a nursery decoration party! Seriously, your parents will eat this up. Nursery parties give them a chance to pour love into their grandbabies before they even arrive. They may even show up with extra toys and items for the room. Just like any remodeling activity, friends and family make the process more fun, and their labor can usually be purchased for a couple of pizzas. Time is money friend, so be frugal and throw a party! Ready to be a Parent Yet? With these tips and tricks, you’ll be on your way to having a beautiful nursery without breaking the bank! Are you interested in getting more tips and tricks for frugal parenting? Check me out over on frugalfirefly.com! I share my tips for frugal living, travel rewards, and personal finance wins as we journey towards financial independence together. I have 2 daughters and while we can hand down the first’s possessions to the second, by far the greatest saver has been gifts from third parties. By which I mean other people’s hand-me-downs. So far we’re talking 2 (accident free) car seats, a pram, lots of winter jackets and a few other clothes. That’s a lot of value there. The other thing that’s helped is keeping a list of things we need for the kids a long time before they’re actually needed. For example, nappies (diapers for you folks the other side of the puddle) a size larger than they currently wear, or a list of clothes in sizes they haven’t grown into. As soon as we find a going-out-of-business sale, out comes the list and we’re at the counter with a ton of stuff labelled “60% off” to “80% off”. Being prepared helps seize the opportunity without buying stuff you don’t need.